It’s the question Ulrike Schaede consistently asks as director of the Japan Forum for Innovation and Technology (JFIT) at the UC San Diego School of Global Policy and Strategy (GPS), where she is a professor of Japanese business. Which is why when one year ago—under Prime Minister Shinzō Abe’s economic policy “Abenomics”—Japan introduced a new goal of 7 percent of managerial positions to be held by women in government and 15 percent in the private sector by 2020, Schaede responded by dreaming up a fast track to support female managers in Japan in this overdue transition. 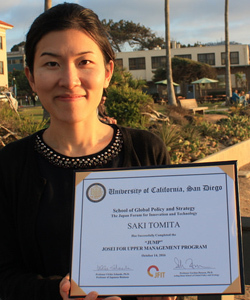 The Josei/Women for Upper Management Program (JUMP) is a full-on immersion program for female managers from Japan to visit San Diego to enhance their global management skills. It pairs participants with personal coaches and a woman mentor in the U.S., offering opportunities to build a global network of women executives and receive hard and soft managerial skill training on campus. Saki Tomita, of the open innovation group at Tokyo Electric Power Co. (TEPCO), was the inaugural participant in the program, completing her stay in October. In addition to attending GPS courses in strategy and negotiation and creativity and leadership, Tomita also received personalized coaching from her mentor, Susan Snow. For Snow, a principal at Transitional Finance Partners in San Diego, their conversations about corporate styles in Japan versus the U.S., including how females rise in the ranks, proved eye-opening as a mentor, too. Fondly, Snow said she was impressed by Tomita’s initiative and courage to tour San Diego on her own, making the most of her short stay—similarly to how boldly Tomita grew a women network through the JUMP program. Tomita attended several networking events with business executives in San Diego, as well as a private tour of Hewlett-Packard that included a discussion with female managers at the company. “I was inspired by how lively they seemed to be at work, and how they are trying to encourage younger female workers,” Tomita recollected. 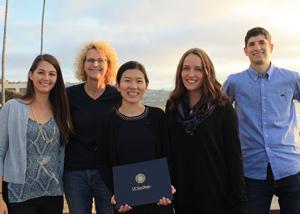 Likewise, Tomita said she was impressed with GPS students she interacted with, such as Ashlee Ellsworth, 2017 MIA candidate, who coordinated a casual “San Diego day” for Tomita. After a walking tour of La Jolla, Tomita tasted real Mexican food—a leap for Tomita who had previously considered Chipotle authentic for the cuisine. For Ellsworth, the opportunity to network with Tomita was illuminating, particularly as a student with a regional focus in Japan. Tomita engaged with students, too, as a guest speaker for JFIT’s weekly Japan Discussion Group. Her class curriculum included negotiation exercises for women, and “live” video conference exercises. In these role-playing exercise, GPS students acted as business colleagues, instructed to provide pushback to Tomita when she informed them about a manufacturing plant relocation and transition in their managerial roles. The lessons learned through the various exercises, as well as similar trainings on negotiation, customer development, presenting public speeches and more, have already proven applicable in Tomita’s job at TEPCO, she said. Most importantly, Tomita concluded, her skills gained through JUMP have given her the confidence to move up the managerial ladder. This, Schaede reminded, is the way in which JFIT—as a forever helping hand to Japan—hopes to move positive change in ways that benefit all of the country. View a photo album of Tomita’s visit.